With a patented low-elongation thread and weaving process, Murakami imports some of the best screen printing mesh available from Nittoku Mills in Japan. SmartMesh out-performs in consistency and durability. 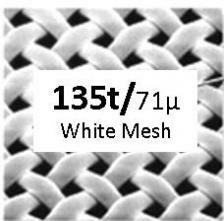 The "S" Thread version mesh use a smaller diameter thread than is standard for a given mesh count. This allows for increased ink transfer and finer detail than is normal for that common mesh count. Printing performance is enhanced but the mesh is also more delicate than the "T" Thread version. Click here for S Thread Handling Instructions. Click here for S Thread Stretching Instructions. Low elongation thread, retains tension better than any brand. Balanced Weft and Warp threads to maintain dot on dot registration. Mesh above 280 is surface treated for excellent emulsion adhesion and better transfer of ink to substrate. Not sure which mesh count to use?....click here for our Mesh Count Application Guide. 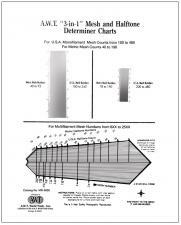 Need a complete list of mesh specifications?....click here for Mesh Count Specification Chart.